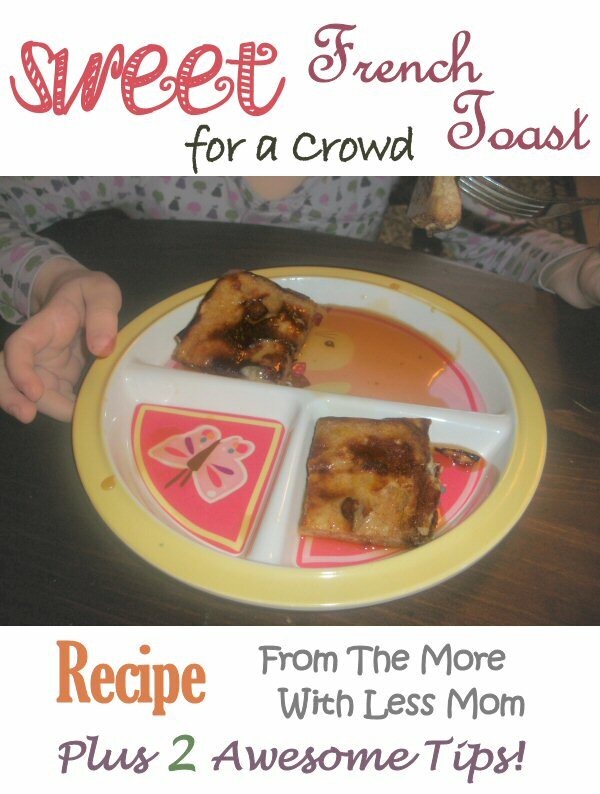 French toast is one of our indulgences, it is inexpensive to make and very tasty. We love french toast. We plan to enjoy some for Easter brunch this year. It’s nice to have Texas Toast on hand to make giant, thick slices of french toast, but not necessary. All I have on hand most of the time is wheat bread, which I’m trying to convince my family they like better than white bread. The flavor difference in french toast with wheat bread is one of the places where this challenge comes to a head. In an effort to blend in the wheat flavor, I added some honey to my batter recipe. What resulted was a very sweet, almost dessert french toast. Flour: You must add flour to your batter. This will give you a fluffy, custardy french toast that is divine. Soaking: You must soak your bread properly. This will allow the batter to penetrate all of the crannies in even cheap bread and give it more flavor and structure. Preheat your skillet or griddle on medium-high heat. I used to use a deep electric skillet (like this one on Amazon) which is a good multi-purpose tool, especially if you run out of burners a lot. I now have a griddle (like this one on Amazon, that I got online from a Black Friday sale for way less than that price) that does six slices at a time that I like. Grease with whatever you like, I used coconut oil this time, but I really like coconut. In a large bowl mix your dry ingredients with a whisk or fork: flours, sugars, salt and cinnamon. In a small bowl mix your wet ingredients: eggs, milk, honey, vanilla, making sure you incorporate the egg yolk. SOAK your bread in your batter. Soak, soakie, soak. Dunk it in, flip it and hold it down with a fork for a count of 10. Flip it again and soak it for a count of 30. You have to let it soak in as much batter as it can. Just do a tester, make one piece and try it so you can add salt, sugar/honey, or cinnamon to your batter if you prefer. Also this feeds the chef so mom doesn’t starve to death before making two loaves of french toast. Once your have your batter prettied up, start assembly lining your toast. Cook until browned, flip and brown the other side (the second side goes much more quickly). Serve with your favorite topping, like maple syrup, honey, powdered sugar, fruit, or berries. These were so sweet for me that I just added enough butter to mine to add a little moisture. I make my own butter spread with real butter, olive oil, and coconut oil, and this added a new layer of flavor to my french toast. If you have leftovers or are making a batch ahead these can be frozen. Place two in a sandwich bag or wrap (very) well with syran wrap. You can thaw them and then pop them in the toaster for a snack. These will be good in the fridge for 4 days or in the freezer for 3 months. I have been craving French Toast for two weeks now…but between hubby and the sons, by the time Saturday rolls around there isn’t anymore bread….but I would love to try it with french wheat bread. I love trying different breads, it changes the whole thing.